It's Friday and time for the last Polkadoodle challenge of 2010! Where did the year go?! As it is our last challenge of the year, it will stay open a bit longer than usual - so the closing date is Sunday 9 January 2011 at 12noon GMT. On behalf of the Design Team I'd like to take this opportunity to wish you all a very Happy Christmas and a wonderful New Year and to thank you for your support, inspiration and love for all Polkadoodle Products! We couldn't do it without you! I (Ruth) am your host this week and I've set my first ever sketch challenge (who-hoo!) with a twist of colouring your own image. The theme can be anything, but as long as the sketch is followed and you've coloured the image (it can be stamped or digi) then you will be eligible for our top three and a lovely Polkadoodle prize! Congratulations! Please email Nikky and put the place you came in the challenge and challenge number in the subject field. Nikky is very very busy at the moment working on the new cd so don't worry if she doesn't respond straight away! Here is the sketch to follow - please remember you must colour the image yourself in what ever medium you wish and feel free to use either a stamped or digi image. Two of our Guest Designers are joining us this week. 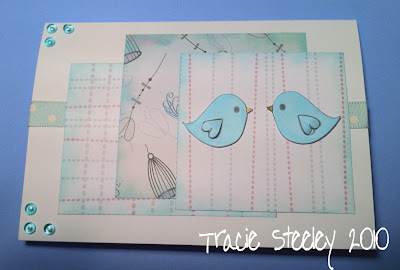 First is Cheryl with this cute card featuring images and papers from Sundae of Seasons. Cheryl has coloured the digi image with Promarkers adding some embellishments from her stash. And next is Ashley with this beautifully coloured card with butterflies and papers from All Around and Everywhere. Just look at the real stitching around the edges! She's added some Doodle Dewdrops too. Ruth: It seems that babies are appearing everywhere and to get ahead, I've decided to use the very cute Nellienoo elephant stamp which has been coloured with Promarkers. All the papers are from Candy Doodles along with the flowers which I have rolled the edges to make them more 3d. Ribbons and gems are from my stash. And as I enjoyed my own sketch (!!) I've made both a boy and girl card! Emma Hi there, I coloured an ATC card with Promarkers, blending Aegean, Cool Aqua and Powder Blue for a background and then stamped using tree, snowflakes and the reindeer horn elements from the Christmas Doodles Rubber Stamp Plate. 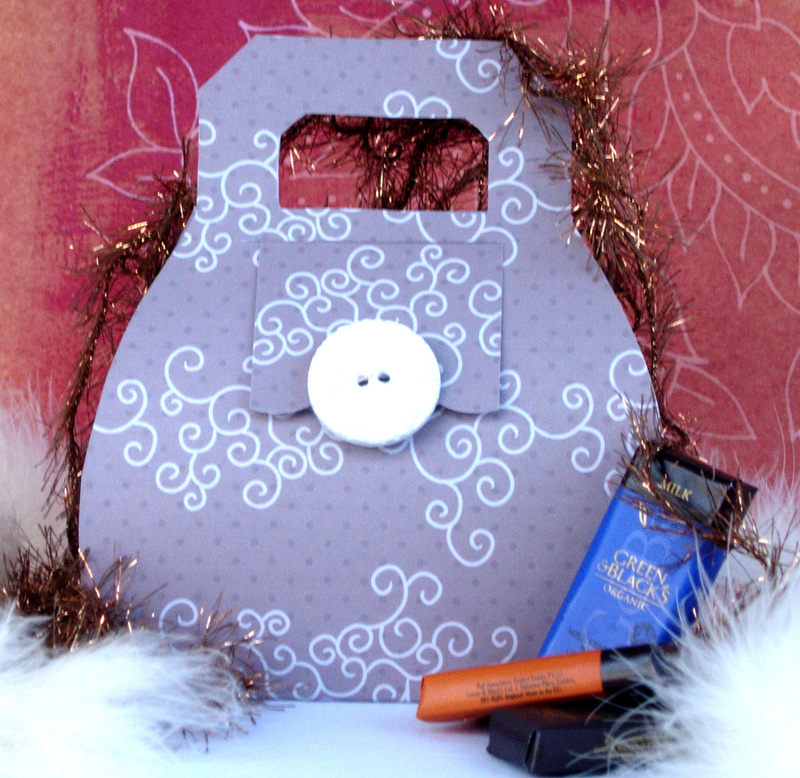 The Scallop trim and background papers are from the Sundae of Seasons CD then stamped with snowflakes from the Christmas Doodles set coloured in with the Promarkers which are all available from the Polkadoodles web shop. Saskia - I made a 'girly' card! The backing papers and sentiment are from the All Around And Everywhere cd-rom. That lovely girl is Fairy Flutterfly Maxine! I used my copic markers and added some extra glitter! Claire - I used a mix of Aquamarkers and Sakura to watercolour Nikky's very cute Reindeer from Paper Boutique 2 - Creative Christmas and combined with some lovely Polka Doodles papers from Sundae of Seasons, with a little stickles! Dee; I've made a gift bag from a C5 envelope for this weeks challenge. 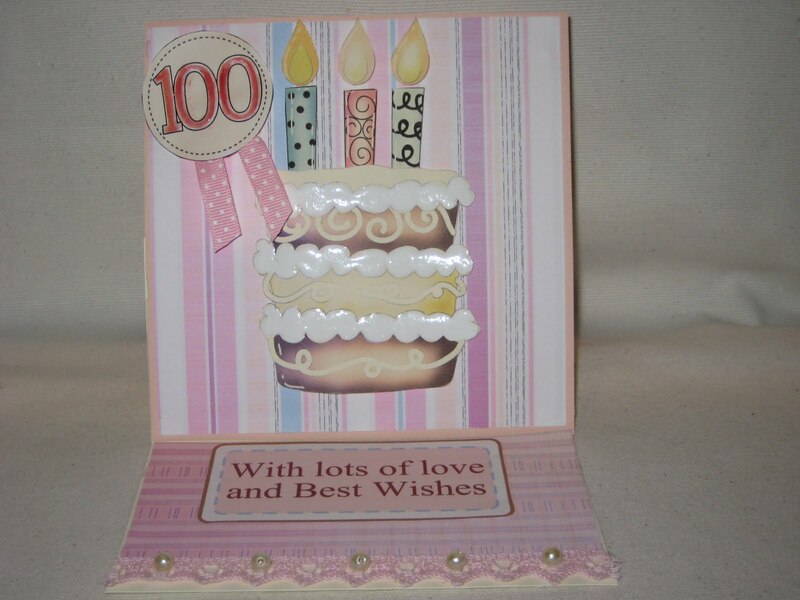 My main image is Nikky's gorgeous cupcakes which I've stamped onto pale blue card and used silver embossing powder. I then watercoloured it with Aquamarkers. I'm sorry to to say it doesn't show that well in the photo, I seem to be going through a bad photographer phase at the moment! I've used papers from Paper Boutique Vol1 cd, Tea Dye and Stormy Sky distress inkpads, Martha Stewart corner punch, recycled brown card, raffia and eyelets. Colette - I used Nikky's pretty Flower Girl stamp and coloured her with Promarkers. The papers came from the Sugar Birdies CD Rom Collectors edition, I printed the plain jane green, straight onto linen card and added the patterned papers to make up the design. A window was cut from the card and the Flower Girl was attached to the insert using foam pads. I made the spira flowers from the Back to Nature CD, and used a Martha Stewart punch for the 'ribbon'. I edged the papers and window with Glamour Dust to add a bit of sparkle. Fliss: My card features Fairy Flutterby stamp Babsie and I stamped her plus the butterfly and some flowers in VersaFine Smokey Gray ink and embossed them with clear powder. A slightly softer look than black. I coloured all the images with Promarkers in warm spicy shades plus green. I also used a glitter pen for some added highlights. I've used papers from the new collection on the Sugar Birdies Collectors Edition CD which launched last week plus a border from Sundae of Seasons CD. Believe it or not, the green panel was coloured with the Meadow Green Promarker and then embossed. 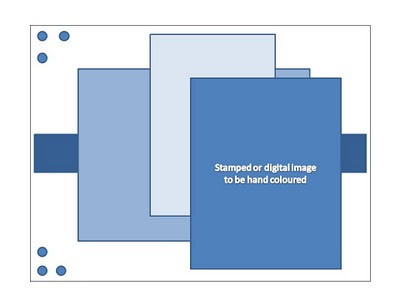 This gives a perfect match for the colour shades on the card. Tracy - I have followed the sketch by using papers from the All Around & Everywhere CD-Rom, and my image is Stamp Doodles Cupcake stand PDSD030, which was coloured with promarkers. Jenny Not my usual teeny tiny card this week, this one is 8"x8"! 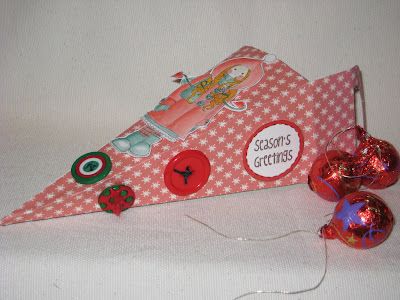 I've decorated it with papers from both Sundae of Seasons and Paper Boutique Creative Christmas. The Festive Postbox stamped image is colored with Aquamarkers. The swirl is actually the bottom of the sleigh from Creative Christmas which is where the little tag came from too. Lastly I've embellished with Doodle Dewdrops and faux stitching with black Promarker. 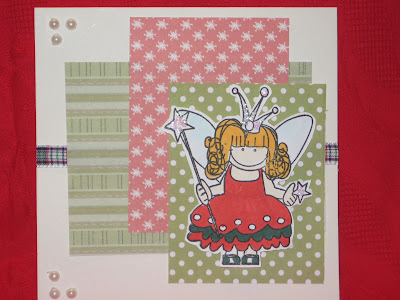 lis-m . this week i have used papers from Sugar Birdies to follow the sketch and used the flutterfly fairy Meshelle. she is coloured with my trusty Promarkers. The sentiment is from Bevvieboo stamp sheet. I made a banner with the papers and finished with a few gems. Miria for this week's theme I made a last minute Christmas card following Ruth's lovely sketch. The stamped image is Polka Doodles Fairy Polly coloured with Promarkers and some glittered accents, the papers I used are from cd Sundae of seasons. Good luck with the challenge! You have until Sunday 9 January at 12noon GMT to enter. Please follow the sketch and remember that the maximum number of challenges you can enter with the creation is 10. It's Friday so time for another Polkadoodle challenge! Hope you're ready for Christmas! 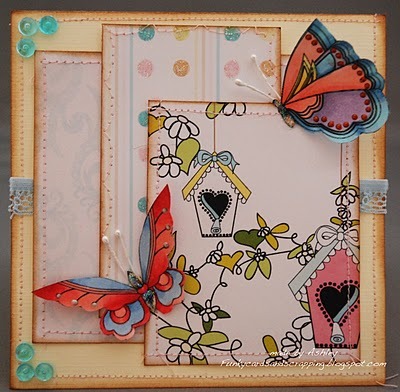 Did you manage to catch Nikky yesterday on Create and Craft with the fantastic new house stamp and sentiment sets? Her last show was a complete sell out so if you want these stamps, you'd better be quick! Congratulations! Please email Nikky for your blinkies! Please remember our 10 challenge rule and to follow the brief. Please do not back link to previous posts - these will be disregarded from our voting for the top three. The deadline for this challenge is Boxing Day - Sunday 26 December at 12noon GMT. Good luck! This week our Guest Designer is Ashley - welcome!! 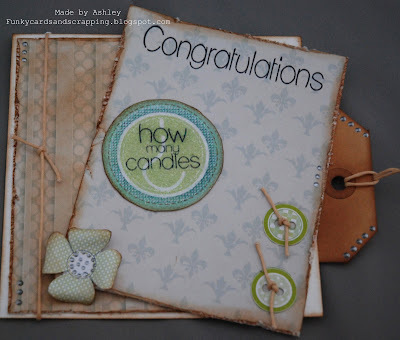 Ashley: I've used All Around and Everywhere for the papers, button and sentiment. 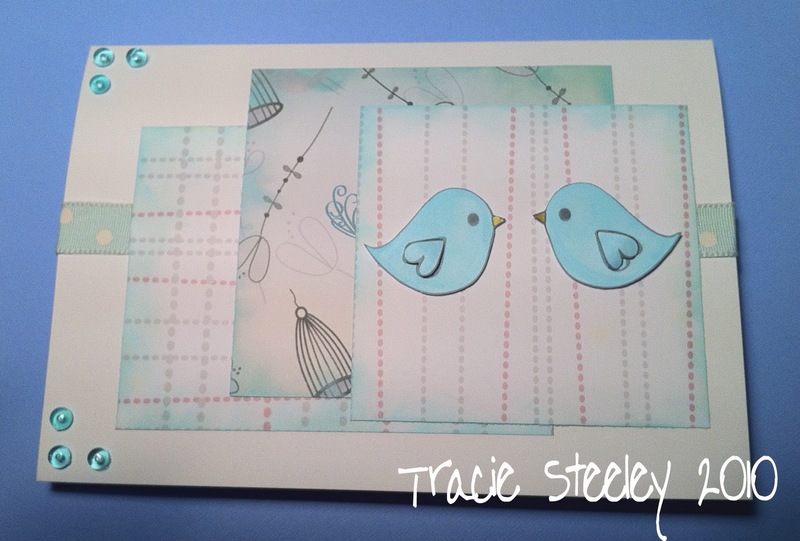 All edges were distressed and clear embossing powder was added to the large circle on the front of the card. The flower is from the same cd. I then added some little silver accents and scrapperfloss and the card was finished! For another view of the partly hidden tag, visit her blog! Ruth: A sparkly 18th Birthday cake! This was made for a family member who recently turned 18. All but the die cut numbers are from Paper Boutique Vol 1. Instead of making the card double sided, I used one of the additional A4 backing sheets as the card base and then layered all the elements on the cake, adding glitter glue to the icing. Claire - If you had a chance to watch Nikky on Create and Craft yesterday you will have seen where these papers and fab imagery came from.....Sugar Birdies! I love these owls poking out from their parcels! Colette My card was also made using papers and images from the fab new collection on the Sugar Birdies CD it's for my father-in-law who will be 80 in January. 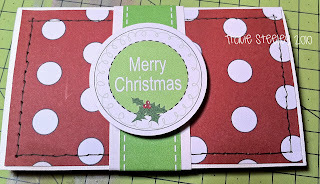 This time I have made a double slider card, if you would like to see it in action, pop along to my blog and watch the video. Saskia - I made this card for my little cousin! The template and the papers are from the Paper Boutique Volume I cd-rom. 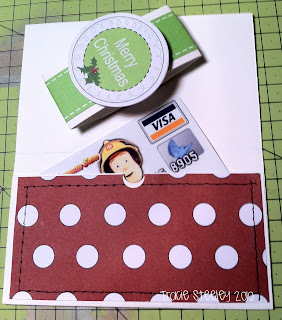 So easy to make such a fun card! Jenny I've made a little 4"x4" card which I think would be suitable for those difficult-to-make-for teenage boys and girls! The birthday sentiment comes from Back to Nature and everything else comes from Sundae of Seasons. I then just had to add some number stickers, ribbon and staples from my stash. 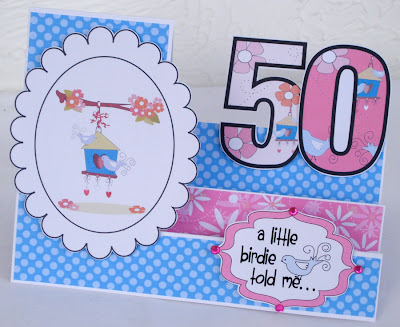 Fliss: I've made a side step card for a 50th birthday as I have one coming up in the family soon so this is a perfect chance to get ahead. I hope you saw Nikky on Create and Craft yesterday with the fab new Collectors Edition of the Sugar Birdies CD with a gorgeous extra collection of sentiments, images and papers. I've used some of the gorgeously pretty new papers on my card together with some of the elements from the original collections - aren't those numbers totally fabulous! 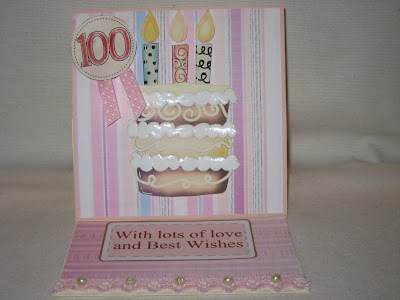 Miria: My creation is an easel card for a lady who will 100 (!) in a few days. It was easy peasy make it: I used some stampies and papers from Sundae of Seasons cd and I printed the number seal and the sentiment from All around and everywhere cd. I added a glossy accent to the cake with inkessential white, the lace and the ribbon are from my stash. Dee; I've made a card for a fun loving 50 year old. All the papers and extra bits are from Sundae of Seasons CD. I edged the numbers with a silver ProMarker, first the fat nib then I went round again with the fine nib. I've added adhesive gems, ribbons and added some faux stitching. The inside is just as decorated as the front. In for a penny, in for a pound as the saying goes. Tracy - I made this for my son Bobby who is 5 in January. 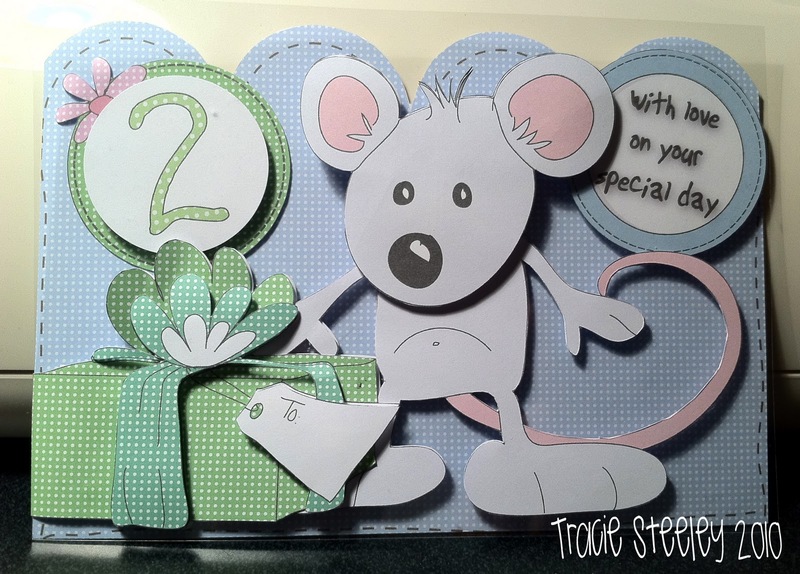 I used the Paper Boutique Vol 1 for the Funky Munky and the backing paper. I decoupaged the image, i'm sure he'll love it. Good luck! All entries to be made via the blue frog below - closing date is Boxing Day - Sunday 26 December at 12noon GMT. Hello, it's Dee here for this weeks post and challenge. Christmas is getting closer and I'm getting very excited, how about you? This weeks challenge is to make a project that holds a gift. It can be for any occasion, so get those creative juices flowing and show us what you can come up with. The deadline for entries is Sunday 19 December at 12noon GMT - please remember to follow the challenge, no backlinking to previous projects or entries and no more than 10 challenges to be entered. Congratulations! Please e-mail Nikky for further details! Our guest designer this week is the lovely Audrey, and I hope you agree with me when I say she's done a fabulous job with her gift boxes. Audrey - I used the Sundae of Seasons CD for the super cute polka dot paper and the sentiments. I used 3D dots on the buttons for some dimension and inked the edges of the paper as well. Saskia : What about a (recycled) box, filled with a lovely presents and delicious Belgian chocolate?! I used the papers and images from the Sundae Of Seasons cd-rom and added some ribbon from my stash. Enfys: I made a little tag book/card for my daughter out of flattened loo rolls covered in various papers from Sundae of Seasons winter collection, and bound with my bind-it-all. The tags were cut with my Cricut. and the last tag has a Starbucks gift voucher. A nice little stocking stuffer! Ruth: I've made a little holder with a surpise inside! I've used a sheet of 12x12 brown card cut down to size with ribbon from my stash. The image is from Paper Boutique - Creative Christmas Vol 2 with added glitter to the cookies and marshmallows. The Nestabilities dies add depth to the image. To see what is inside, visit my blog! Jenny I've made the tiny takeout gift box from Creative Christmas and decorated it with elements from Love and Cherish. As the little bird (robin?) was already pre-coloured pink I've opted to make the whole thing pink and girlie and coloured my poinsettia Chrimbo Doodles stamped images with Magenta ProMarker. I've tied the top with ribbon so it can be hung on the tree! 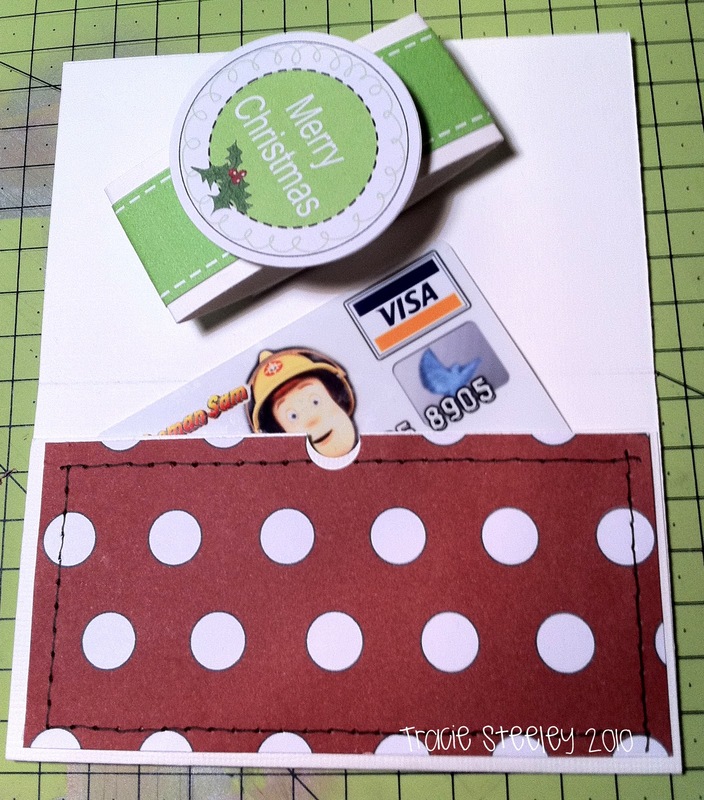 Brenda - I have created a box and matching gift card which has a pocket inside. 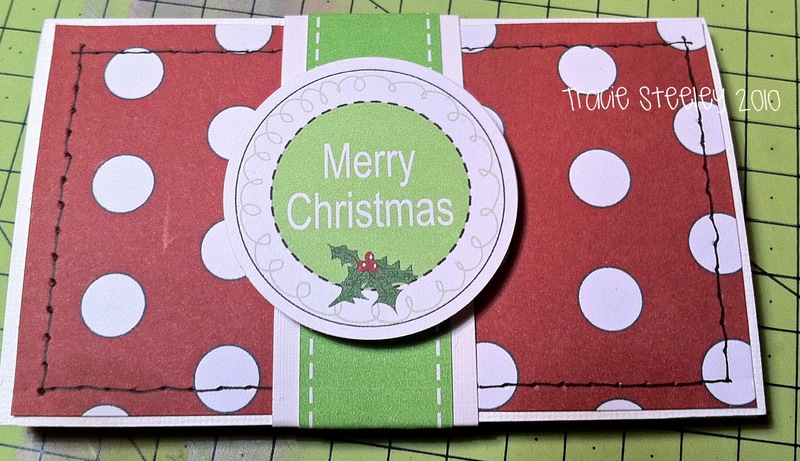 Paper is from Sundae of Seasons CD and the greeting from Jingle Jangle Christmas stamp set. Flowers are leaves are punched and pearls to embellish. Miria This is my first DT project and I'm so thrilled to join such a great team! My creation is a chocolate box; I used the icicle box template from Love and Cherish cd, the papers and the black and white stampie are from Sundae of seasons cd,I coloured the image with watercolour pencils and ProMarkers. The sentiment is a Polkadoodle stamp that you can find here. The buttons are from my stash. Dee: I've made a Christmas cracker for my project. I've filled it with jelly beans, but you could put what ever you like in it as long as it fits. All the papers and elements are from Jingle Jangles CD. I just love all the whimsical artwork on it. I added red polka dot and gingham ribbon and used a Martha Stewart punch. I resisted the urge to smother it in glitter, I may yet change my mind though. Emma Hello all, I have made a batch of giftbags to have on standby to hold some of my handmade Christmas goodies. The paper was from Jingle Jangle Christmas cd rom, the stamps are the Fairy Babsie and the gifts she holds are from the Christmas Doodles stamp plate, the sentiment is from the Sensational Sentiments stamp plate(due in stock soon). Coloured with ProMarkers and highlighted with Stickles, all to be found in Polka Doodles shop. Tracy - I have made a gift box using the Paper Boutique Creative Christmas, the paper and the sentiment is from the same CD. The poinsettia is from the Crimbo Doodles stamp set. 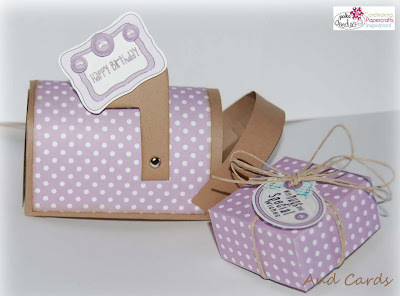 Fliss: I have made a handbag style gift box from the gorgeous Elegant Bag section of the Paper Boutique Volume 1 CD as my younger daughter loves handbags and the beautiful paper from the collection which I printed it out onto is a favourite colour of hers. As she's not keen on fussy things, I simply added a pretty carved button as an embellishment. I'll be filling it with her favourite chocs as a small Christmas gift. 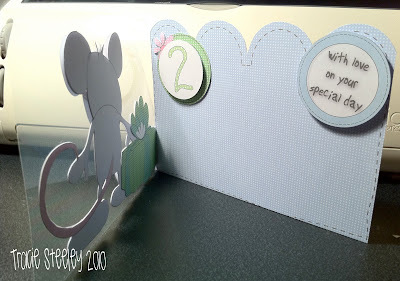 Lis-m: I decided to create a tea-light holder card, but in an easel style. I used Sundae of Seasons cd for my papers and my little angel girl. In fact, I think the sentiment is from there too. I love candles and tea-lights at any time of year, but I think at Christmas they have that extra twinkle! Claire My project to hold a gift is a folder and notecards. I have used imagery and papers from the Back to nature cd and also the Sundae of Seasons cd. A quick project and a great gift that I think most folk would appreciate! Good luck! The deadline for entries is Sunday 19 December at 12noon GMT, please link up your project with the widget below, remembering our rules!